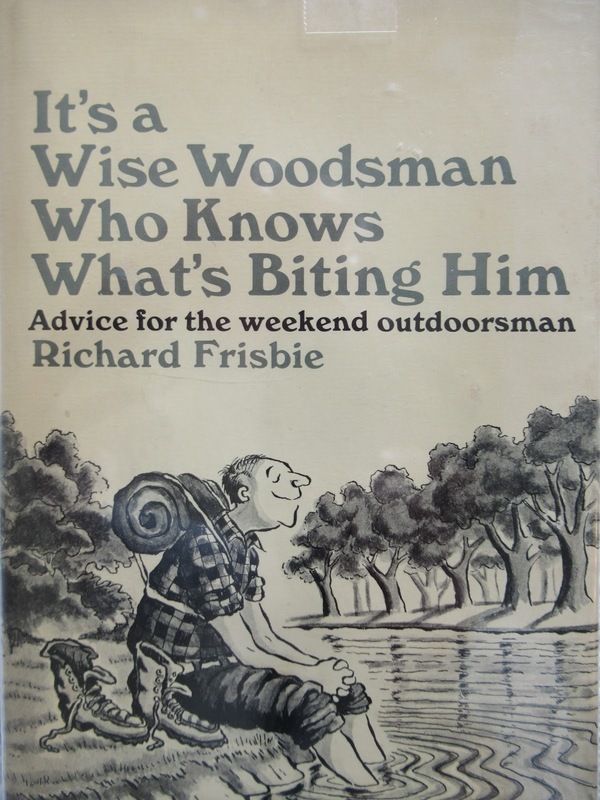 In 1970, on the new books display at Susan E. Wagner High School’s Library, I found Richard Frisbie’s It’s a Wise Woodsman Who Knows What’s Biting Him: Advice for the Weekend Outdoorsman. 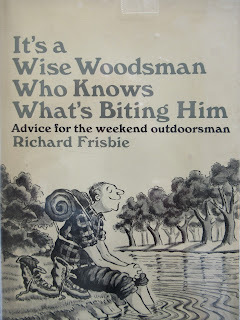 of "It's A Wise Woodsman Who Knows What's Biting Him"
It’s A Wise Woodsman bowled me over. It made being outdoors seem fun and something a person could learn to do. The writing was funny and insightful. When my father took me and my sister camping at Rudd Pond, he trailered a small, Frisbie-esque sailboat. He also tried to convince us that hamburgers were a breakfast food; my sister persuaded him to get cereal instead. Since high school, I’ve taken many excursions, made mistakes, learned things and enjoyed it all. The spirit of Richard’s writing went on all these trips. With retirement approaching, I wanted to re-read this book. My daughter found a copy of it and gave it to me for Father’s Day, 2017. Writing styles and reader interests change. Books can be different when re-read. Yet, It’s A Wise Woodsman reads as well in the 21st century as it did when I was in high school. Despite 50 years of changes in outdoor technology and practices, it remains relevant and indispensable. Part of the reason for this is that Richard concentrated on basics rather than on products. For example, he focused on staying dry while hiking or camping, instead of whether the materials should be Gore-Tex, nylon, plastic or rubber. Considering Margery’s advice and chastened by the sight of big waves every day, Richard discovered Currituck Sound. Richard built his own sailboat and wrote a how-to book about building sailboats. 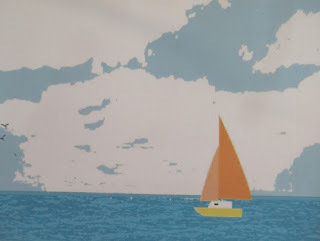 This painting of Richard's sailboat, Dawn Treader, was done by Richard's daughter, Felicity. After re-reading It’s A Wise Woodsman, I wondered what had happened to Richard. A Google search revealed his e-mail and I wrote him a fan letter. 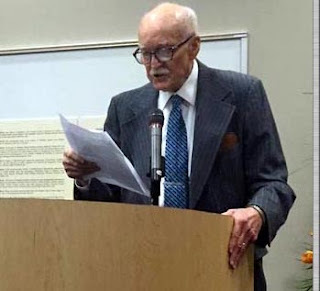 Richard, who was 90 at the time, wrote back. He explained that he no longer roamed as far afield as he had in the book. But he continued having miniature adventures nearby, along the Des Plaines River and in the Cook County Forest Preserve. Richard and Margery, who was a college press officer at Mundelein College (since absorbed by Loyola University) met when Richard was covering a press conference at the College that introduced a new faculty member. That faculty member was Elizabeth Bentley, a courier for Soviet spies who renounced that life and converted to Catholicism. 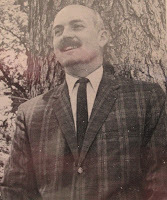 Margery is the author of six books, the first co-written with Richard, and a newspaper and magazine writer. It was she who wrote me this past summer with the sad news that Richard died. With Richard’s departure, we have lost a great nature writer. But Richard and Margery have passed on their love of nature and writing. Their son Thomas observed, "We all still feel his presence every time we put on a backpack or a pair of hiking boots and head out the door." And all eight Frisbie children are writers. Author's note: Richard had a witty and informative website on writing. As of now, it is operational and well worth the read. The site also includes Richard's memoir on writing, mentioned above.